A few years ago we witnessed the same dramatic increase in home heating oil prices that we are seeing right now. As forecasters predicted a constant slow increase over that summer and into the winter, we saw a dramatic increase in the spring and summer sales of pellet stoves. You may remember hearing this as pellets and pellet stoves were being bought and installed at record rates. Well, forecasters are again predicting the slow and steady rise of oil and gas prices. Home heating prices are up 30% at an average of $3.85/gallon. And we are seeing an increased interest in information about pellet stoves and inserts. Pellet stoves are an efficient and simple way to supplement your home heating needs. The Heritage Pellet stove, with high-end aesthetic design in cast iron and stone, is both beautiful and efficient. This stove technologically advanced and is certified by the EPA as one of the cleanest burning and most efficient pellet stoves on the market. 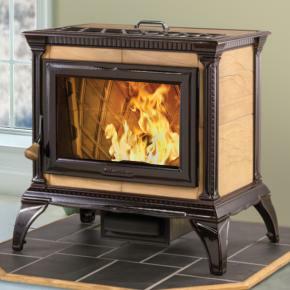 This is truly one of the best wood pellet stoves. We have this stove burning daily in our store for you to see. Let go of all of your preconceptions about pellet stoves and pellet flames. This stove is beautiful to look at with an oversized viewing glass; you can enjoy one of the prettiest pellet flames in the industry. The Pellet making factories have been built and pellets are sold on line and at most hardware stores and are easy to store with no mess. So as heating prices rise, gather your information now, so you can make the best decision for your home before everyone else decides to do the same.